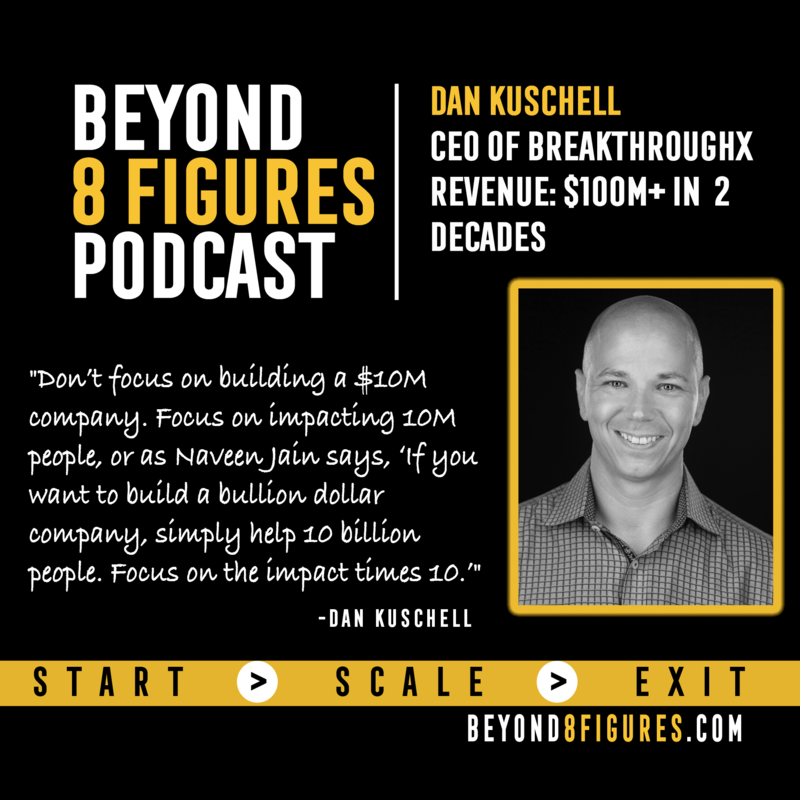 Dan Kuschell talks about what he has learned over his 3+ decades in business and how he is applying those lessons to his current business. -Differentiating yourself with an extra layer of care. -Why Dan chose to sell his companies and how he reached his pivot point. -The three key questions Dan bases all his decisions off of today. -What he is doing with his business now and how he has learned from his previous ventures. -Don't focus on building a $10M company. Focus on impacting 10 million people or as Naveen Jain says:  If you want to build a billion dollar company, simply help 10 billion people. Focus on the impact x 10. -If you want a breakthrough, be willing to break something and be willing to destroy anything that isn't excellent. -Everybody is busy and has minimal time, so do the most with the shortest amount of time. About Dan Kuschell: Dan is a husband, dad, serial entrepreneur and angel investor. He's the co-founder, Chairman, and CEO of Breakthrough3X. He helps business owners like you connect the dots, see the blind-spots, and get unstuck, by helping you implement unique sales and marketing systems so you get more clients, growth, and profits and have a bigger impact, reach, and contribution. With over 25 years of business experience, he's started 11+ companies, coached over 5,329 business owners from over 180 niche industries, 9 countries, and had clients and partners like Joe Polish, Dean Graziosi, Genius Network, and more. He’s bought and sold multiple companies, is a regular media contributor, hosts his own radio show, and been a guest featured on multiple TV, radio, print, and online publications (like ESPN, NBC, Speed, Thrive, Huffington Post, and more).